There was a poor farmer in a village. He had a tiny piece of land which produced barely enough for his survival. One day, while he was working in the field, he saw a huge cobra sitting on a nearby anthill. The farmer thought that the cobra must be the god of the anthill. He was a god-fearing person, so he decided to start worshipping the cobra. He rushed to his house and came back with a bowl of milk. He offered the milk bowl to the cobra. Next day, when the farmer went to collect the bowl, he found a gold coin in it. The farmer was astonished to see the gold coin and kept it as a blessing from the cobra. After that, it became a routine for the farmer. Every day, he would offer a bowl of milk and got a gold coin in lieu of that. Pretty soon, the farmer became a rich person because of all those gold coins. After some time elapsed; one day the farmer had to go to the nearby town for some urgent work. 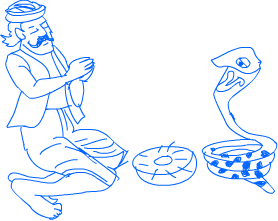 He disclosed the secret of cobra and the gold coins to his son and asked his son to not miss offering milk to the cobra even a single day. But his son was too greedy. He thought that the cobra must be sitting on a huge pile of gold coins. He thought of grabbing all the gold coins at one go and decided to kill the cobra. When the son tried to kill the cobra, the cobra bit him and he died because of snake bite.